The grounds at the Irish Cultural Center were looking in immaculate shape for the North American Finals over Labor Day weekend. There were three days of games, 120 teams, and 2,500 players competing for the county finals in several grades of men’s and ladies Gaelic football, hurling, and camogie. Senior dignitaries traveled from Ireland to witness the largest Gaelic games event outside of Ireland, and get a first-hand look at the main event in the calendar of the GAA in North America. President, Liam O’Neill, President elect, Aoghan O’Fearghuil, and Camogie chairperson, Aileen Lawlor and Ladies football president Pat Quill, were present for the three day event to witness the fruits of the efforts of the exiles and enthusiasm and passion that the native born Americans have for the games of the Gael. Local teams ended up with a haul of 6 national trophies, while Ulster of San Francisco made it three in a row in the final game on Sunday. In junior B action, the Barley House Wolves gave it a good rattle but ended up on the losing end to San Jose by a score of 1-13 to 2-15. It was a good tournament overall for the BHW who fielded teams in the junior C and junior B completion, making the semi-final in one and the final in the other. Donegal junior A footballers were crowned junior A football champions following an objection against Chicago’s John McBride’s. Having lost out by a score of 0-17 to 3-9 it was ascertained that McBride’s fielded a player who was sent off in the previous day’s senior match with St. Brendan’s. It really should not have come to that as having led at one point by nine points, Donegal conceded two goals and five points in the final 10 minutes. The second half saw Donegal open up the lead to nine points. Donegal enjoyed most of the possession with Dean Kelly and Mark Dunphy moved the ball well in the middle of the field. Outscoring their opponents seven points to one over the following 15 minutes Donegal looked to be cruising. Chicago looked dangerous when in possession however. The visiting side pulled back a goal, and following that Byrne made two fantastic saves. The writing was on the wall however. The high ball into the corner forward was proving a successful tactic and a third goal went in to reduce the gap to two points. With Chicago winning every kickout and Donegal now struggling to win any sort of possession three points on the trot saw the boys from the Windy City take the cup at the death, but later news confirmed that it was Donegal official winners following the objection. The junior A hurlers of Wexford faced a very strong looking Vancouver side in the junior A hurling final. Wexford were up against it from the beginning. An early goal from the Canadians was followed by the loss of Brian Dalton to a red card and the home team were chasing the game the rest of the way. Wexford could not dent the a three point differential. Another goal early in the half by Donnellan for Vancouver proved to keep their noses ahead throughout the second half. Wexford drew within a goal following four points on the trot from Power frees. The key for Vancouver was to maintain a clean sheet in the goals column and the visiting side accomplished that part of their mission. With Peter Ryan ploughing a lonely furrow inside the 21 the prospects for Wexford were not good. The sides traded points as Vancouver matched some long range efforts by Wexford with some well taken efforts of their own, but that gap could not be reduced by the home team. A deserved win for the Canadian side and captain Tommy Burke was gracious in his victory speech after accepting the trophy from Liam O’Neill. 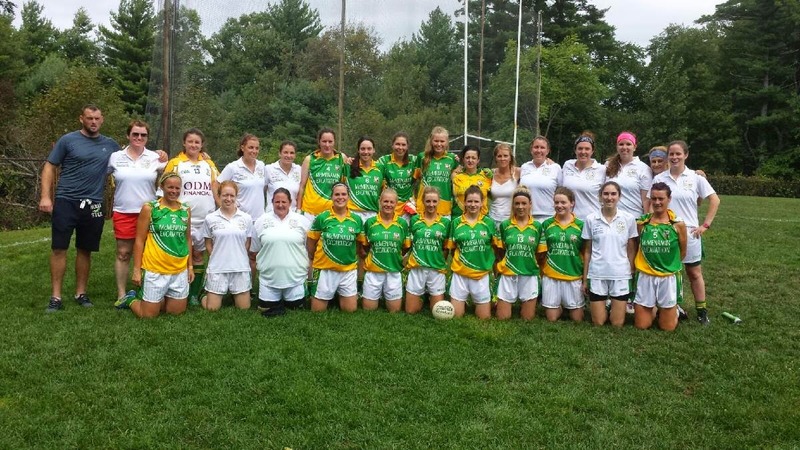 Boston Shamrocks made it two for two for Boston on the ladies football front with a close run victory over St. Mike’s of Toronto in the junior A final. The home side came out on the right side of a 3-13 to 2-14 final to capture the first North American title since the seniors took the cup in Philadelphia in 2003. Leading by 10 points at the break, Toronto stormed back into the game and drew level, forcing extra time. The Shamrocks held a two point lead till late in the game and breathed a sigh of relief to see a last minute effort fly wide of the posts. 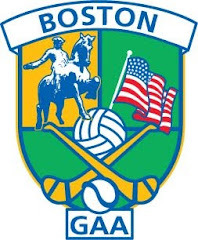 In the senior camogie championship, Caroline Hanley’s last after 16 years with the Boston outfit, Eire Og captured the cup with a 2-7 to 0-9 victory over Toronto to continue the legacy of North America’s most successful camogie club. Galway senior hurlers NACB champions! Galway made amends for last weekend’s defeat to Fr. Tom’s with a well earned victory in the NACB final against a game Naomh Padraig from San Francisco. Galway led from 15 minutes in and the closest that their opponents got was 5 points in the second half. Rory Hickey at center forward played a great 60 minutes, while Chris Murphy won the John Hehir player of the tournament trophy. On an additional note, American Born Dan Swetland had a senior hurling medal to go with his junior C won earlier in the day.